A holy virgin who suffered martyrdom in Alexandria during a local uprising against the Christians previous to the persecution of Decius (end of 248, or beginning of 249). During the festivities commemorative of the first millenary of the Roman Empire, the agitation of the heathen populace rose to a great height, and when one of their poets prophesied a calamity, they committed bloody outrages on the Christians whom the authorities made no effort to protect. The great Dionysius, then Bishop of Alexandria (247-265), relates the sufferings of his people in a letter addressed to Fabius, Bishop of Antioch, long extracts from which Eusebius has preserved for us (Church History I.6.41). After describing how a Christian man and woman, named respectively Metras and Quinta, were seized by the seditious mob and put to death with the most cruel tortures, and how the houses of several other Christians were completely pillaged, Dionysius continues: "At that time Apollonia the parthénos presbûtis (virgo presbytera, by which he very probably means not a virgin advanced in years, but a deaconess) was held in high esteem. These men seized her also and by repeated blows broke all her teeth. They then erected outside the city gates a pile of fagots and threatened to burn her alive if she refused to repeat after them impious words (either a blasphemy against Christ, or an invocation of the heathen gods). Given, at her own request, a little freedom, she sprang quickly into the fire and was burned to death." Apollonia belongs, therefore, to that class of early Christian martyrs who did not await the death they were threatened with, but either to preserve their chastity, or because confronted with the alternative of renouncing their faith or suffering death, voluntarily embraced the latter in the form prepared for them. In the honour paid to her martyrs the Church made no distinction between these women and others. St. Augustine touches on this question in the first book of the "City of God", apropos of suicide (City of God I.26); "But, they say, during the time of persecution certain holy women plunged into the water with the intention of being swept away by the waves and drowned, and thus preserve their threatened chastity. Although they quitted life in this wise, nevertheless they receive high honour as martyrs in the Catholic Church and their feasts are observed with great ceremony. This is a matter on which I dare not pass judgment lightly. For I know not but that the Church was divinely authorized through trustworthy revelations to honour thus the memory of these Christians. It may be that such is the case. May it not be, too, that these acted in such a manner, not through human caprice but on the command of God, not erroneously but through obedience, as we must believe in the case of Samson? When, however, God gives a command and makes it clearly known, who would account obedience thereto a crime or condemn such pious devotion and ready service?" 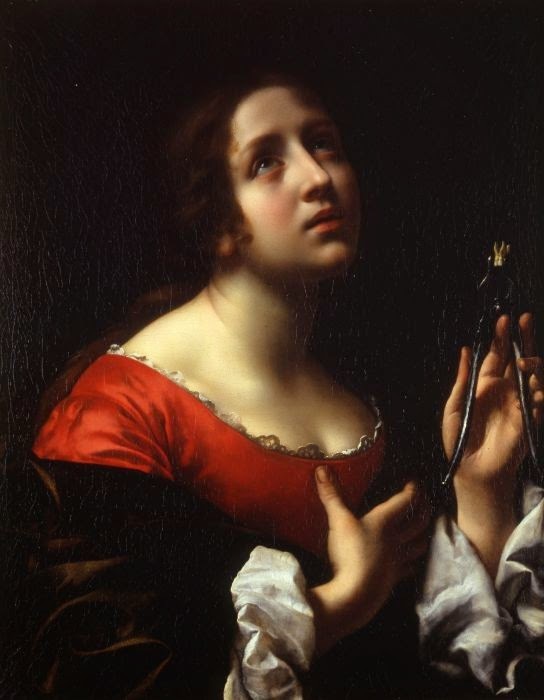 The narrative of Dionysius does not suggest the slightest reproach as to this act of St. Apollonia; in his eyes she was as much a martyr as the others, and as such she was revered in the Alexandrian Church. In time, her feast was also popular in the West. A later legend assigned a similar martyrdom to Apollonia, a Christian virgin of Rome in the reign of Julian the Apostate. There was, however, but one martyr of this name, i.e. the Saint of Alexandria. The Roman Church celebrates her memory on 9 February, and she is popularly invoked against the toothache because of the torments she had to endure. She is represented in art with pincers in which a tooth is held. There was a church dedicated to her at Rome but it no longer exists. The little square, however, in which it stood is still called "Piazza Sant' Apollonia".